A night of dancing with the scene's top DJs playing House, disco, broken beats, jazz and more. 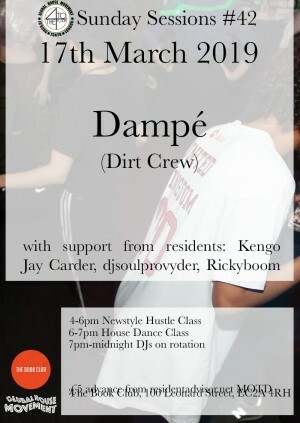 For our March dance we welcome Dampé, a studio and live project from South East London. Since moving to the city, the producer has been intimately involved in its club culture – from running warehouse spaces and booking venues to DJing and performing in groups across the city and Europe, under a slew of different aliases. March marks the release of his forthcoming self-titled EP so we invited him down to play a set! Support as usual from residents.